Annuals, 30-100(-180+) cm. Leaf blades 80-150+ mm overall, lobes or leaflets 9-17+, narrowly lanceolate to lance-linear, 12-25(-50+) × (2-)4-7+ mm. Heads in ± corymbiform clusters. Peduncles 1-5+ mm. Involucres 7-10+ × 1.5-3 mm. Ray florets 1-3; laminae yellow, ± ovate to elliptic, 1-2 mm. Disc florets 3-5; corollas 3-4 mm. Cypselae (4.5-)6-7+ mm; pappi of 1-2 ± subulate scales 2-3+ mm plus 3-5 distinct, ovate to lanceolate scales 0.5-1 mm. 2n = 48. Flowering Sep-Oct. Disturbed sites; 0-100+ m; introduced; Ala., Calif., Conn., Fla., Ga., Md., Mass., N.C., Pa., S.C., Va.; South America. 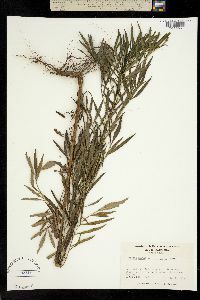 Tagetes minuta is widely cultivated for use as a condiment and has become widely established or persists after plantings. Strong-smelling annual 3-10 dm; lvs pinnately compound; lfls 9-17, lance- linear, 1.5-6 cm, sharply serrate; heads numerous, tending to form flat-topped clusters; invol narrowly cylindric, 8-12 mm, with 3-5 short teeth, few-fld, the rays commonly 3, only 1-2 mm; achenes 5-6 mm; longer pappus-scales 2-3 mm, the others less than 1 mm; 2n=48. Native of S. 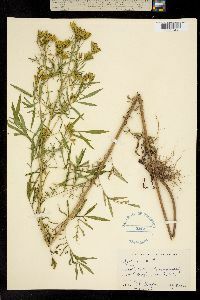 Amer., now ±established as a weed in disturbed sites n. to Va. and rarely beyond. Aug.-Oct.